I can’t help but think during this Advent Season of the voices of the biblical prophets and what influence, if any, they exert in the protests of the Occupy Wall Street Movement. From all I gather, this has been pretty much a secular movement, yet firmly rooted in the moral, ethical and spiritual principles of justice. The disparities between rich and poor in this country have broadened to catastrophic proportions. Political views and, for that matter, politicians themselves, are polarized on how to address the matter. It is not in any way, shape, or form, an abstract issue that requires some think tank to engage in philosophical study in order to generate a solution. People are unemployed, people are poor, people are hungry, people are homeless; and they are becoming more so in increasingly alarming numbers. Amos was particularly preoccupied with the moral corruption of his generation and their theological misconceptions. He denounced the corrupt aristocracy and its total neglect of the poor. He criticized those who made sacrifices to God but hypocritically neglected the moral law. He inveighed against those who presumed that they need give no accounting to God for their actions because they were His Chosen People. In much the same way today, the arrogance of the United States in general, its infatuation with illusory exceptionalism, makes it a prime target for collapse and ruin. We could call it the wrath of God, but I prefer to see it as the ravages of sin. I heard a radio preacher the other morning state that America doesn’t have an economic problem; it has a spiritual problem. Inclined as I am to disagree with radio evangelists and immediately reject them out of hand, I couldn’t find much of an argument with this one. Is anyone out there listening? These words were later echoed by Jesus in the Gospel of Luke. But they should be our words. We all have a calling and responsibility as God’s children to fulfill this prophecy. We cannot turn our back on any form of injustice, economic or other. 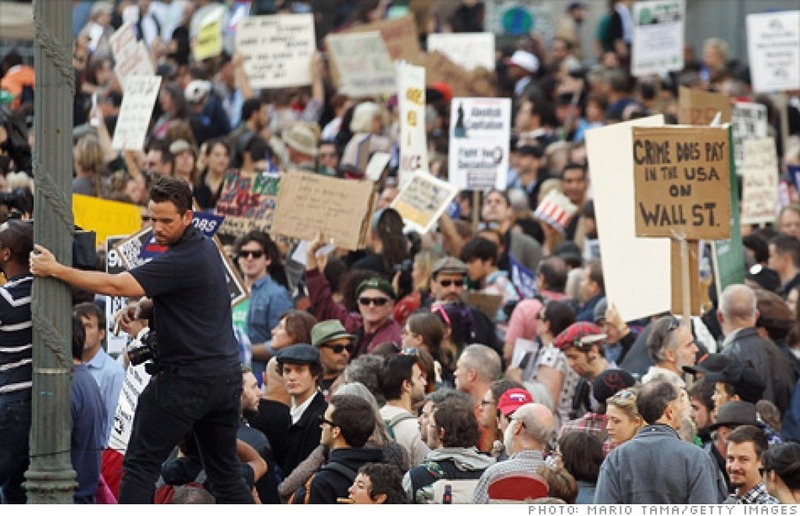 Though we may not physically be a part of the Occupy Wall Street movement, we are involved. Though we may not be protesters, we must be prophets. We cannot sit idly by. As we celebrate Advent and the coming of “God with us”, may the Lord occupy our hearts and minds and souls, that we may be preoccupied with our brothers and sisters who, like us, are creatures made and loved by our Heavenly Father. It is absolutely the case that America has a spiritual problem. We can all do more than any movement like “OWS” if we were to help each other every day instead of railing for common proportions of that which has already been “given unto Caesar”.